Q: The beveled sides, is that black or polished? A: The top of the ring is solid black tungsten and the beveled edges are a polished tungsten finish. Was this answer helpful? 19 of 22 Customer(s) found this Answer helpful. Q: Hello, My friends suggested to order a ring from your website! :) I have two questions: 1. 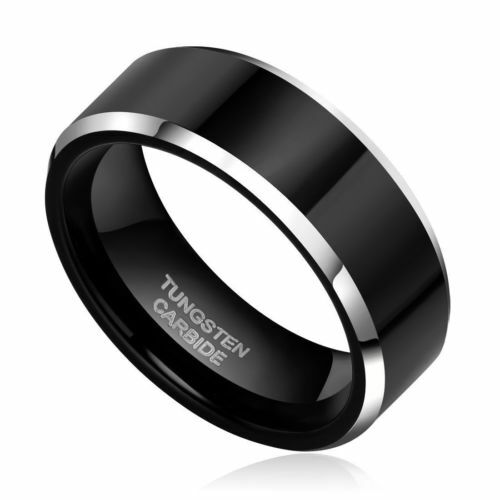 Can I order this style of ring "Genno Black Beveled Tungsten Carbide Ring 8MM" without the polished silver edges? I want this exact ring in all black. 2. For engravings, can I get the engraving on the inside of the ring? Not the outside. Thanks so much! Q: How do I find out about my size? Q: I was wondering if the black part of this ring could I get in a matt finish then a polish finish. Is it possible? Leave the silver the same. Thank You! A: This ring actually comes in the matte finish. The photo of the ring looks as if it is polished, but it is that matte you are requesting. I hope this helps! Q: CAN THIS BE FOR WOMEN AS WELL? A: Absolutely! Many women purchase this ring style. If you do not love the ring when you receive it, you can send it back for a full refund or exchange! Thank you, TF! Q: Does the black wear off easily? Q: If I order the wrong size, can I return it for a different size? I don't remember my ring size. Q: Is it silver on the sides or just shiny? Q: is this ring black with silver trim or solid black? The ring is extremely nice and very comfortable. It looks great on my finer and I'm always getting compliments on it. It I would definitely recommend it to friends. the shipping was also fast. Very nice ring!!! Would recommend to anyone looking for a ring that will last! You can't beat the price! This is a beautiful ring. My husband loves it! The ring exceeded my expectations. Great quality and fast delivery! Lost my original Tungsten Carbide band which I paid $375 for in 2006 & found this website. Took a chance on it & boom, love it! The ring is just as it appears but even better on my finger. Have received quite a few compliments on it. It is a nice addition to anyone's jewelry. WELL WORTH IT,NICE LOOKING RING. My husband absolutely loves his ring, great quality and very comfortable.. Strongly recommend your company to everyone. Great customer care.. This ring is amazing looks just like the picture my husband loves it. This has been the most pleasant experience I have ever had shopping. I goofed and ordered wrong size (But the ring was Beautiful). Followed directions and mailed it back requesting a smaller ring and received it in 3-4 days. The Quality and Beauty of the ring are unparalleled!! !I will be back, no doubt. Most friendly people to deal with. AAAAAAAAAAA+ in every aspect! I read good reviews and was still skeptical.. but finally ordered it. Have had it for a little over a month now.. Wear it daily and the bevel still shines like new and the black face shows no sign of wearing off. It's heavier than I figured it would be but it is a good thing.. Recommend to anyone on the fence about it. Great investment! My husband loved it!! Got this as a present for my son. Cannot wait to give him the ring. Absolutely gorgeous and great quality! Everyone at the office loved it when the ring arrived. Great value, will be buying more! I was looking for a black tungsten ring and this was perfect at a great price. I am very happy and will be ordering again because the shipping was also very fast.